The Ship/Submarine Recycling Program (SRP) is the process the United States Navy uses to dispose of decommissioned nuclear vessels. SRP takes place only at the Puget Sound Naval Shipyard (PSNS) in Bremerton, Washington, but the preparations can begin elsewhere. Before SRP can begin, the ship or submarine must have her nuclear fuel removed. Defueling usually coincides with decommissioning. Prior to that event, the vessel referred to as "USS Name," but afterward the "USS" is dropped and it is referred to as "ex-Name." Defueling of submarines is carried out at five ship repair facilities on the West Coast, and the hulks are then towed to PSNS. Reusable equipment is removed at the same time as the fuel. Spent nuclear fuel is shipped by rail to the Naval Reactor Facility in the Idaho National Engineering and Environmental Laboratory (INEEL), located 67 kilometers (42 miles) northwest of Idaho Falls, Idaho, where it is stored. The fuel is not reprocessed. At PSNS the SRP proper begins. A submarine is cut into three or four pieces: the aft section, the reactor compartment, the missile compartment if one exists, and the forward section. Missile compartments are dismantled according to the provisions of the Strategic Arms Reductions Treaty. The ends of the reactor compartment are sealed and shipped by barge and multiple-wheel high-capacity trailers to the Department of Energy's Hanford Nuclear Reservation in Washington state where they are buried. The burial trenches have been evaluated to be secure for at least 600 years before the first pinhole penetration of some lead containment areas of the reactor compartment packages occurs, and several thousand years before leakage becomes possible. Until 1991, the forward and aft sections of the submarines were rejoined and placed in floating storage. Various proposals for disposal of those hulks were considered, including sinking them at sea, but none were economically practical. All required removal of the numerous polychlorinated biphenyl products (PCBs) on board, which are considered hazardous materials by the Environmental Protection Agency and United States Coast Guard. In order to reduce the costs, the remaining submarine sections are recycled, returning reusable materials to production. In the process of submarine recycling, all hazardous and toxic wastes are identified and removed, reusable equipment is removed and put into inventory. Scrap metals and all other materials are sold to private companies or reused. The overall process is not profitable, but does provide some cost relief. Disposal of submarines by the SRP costs US$25-50 million per submarine. By the end of 1994, 180 nuclear submarines had been built in the US. Nearly 80 have been decommissioned, and 43 reactor compartments have been cut and are stored at Hanford. 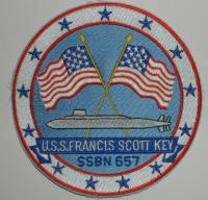 The Navy plans to decommission all remaining submarines of the Sturgeon and Benjamin Franklin classes in the first decade of the 21st century, and has already begun to decommission some of the Los Angeles and Ohio boats.